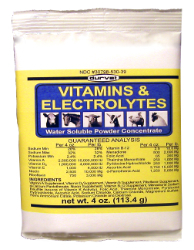 A water soluble premix of vitamins and electrolytes formulated to be a nutrient supplement applicable for use when normal feed intakes are reduced. Can be used as a water or feed additive. Convenient 4 oz. package can be mixed and administered easily. Excellent solubility. Concentrate formula allows for more nutrients per ounce of powder. For use on cattle, horses, goats, sheep, swine, and poultry.